Trend Alert: The Bridal Pantsuit? Am I for real? I sure am. Earlier this year Carolina Herrera debuted her first ever bridal pantsuit, and since then lots of other designers have been taking note. I mean the suit is lovely, is it not? I probably wouldn't have considered it for my wedding, but I wouldn't mind wearing it SOMEWHERE. And although some of the wedding pantsuits coming down the runway do look dressy enough for a wedding, others are more suited for one of P-Diddy's "white" parties. Here is another beautiful suit by Yuki Katsura. 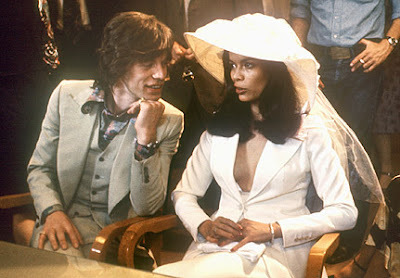 It's hard to believe, but Bianca Jagger got married to her rockstar husband in a similar ensemble 42 years ago. So tell me, what do you think? Even though this style will never be worn by the majority of brides, could it work for some of the super-independent ladies out there?